Chrichton's World: Review 30 Minutes or less (2011): Don't waste your time with this one! 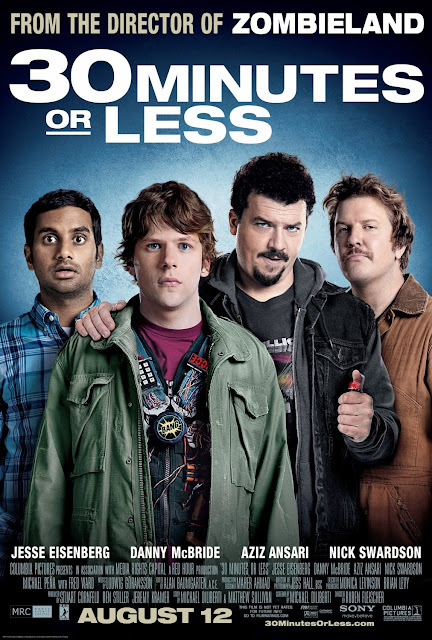 Review 30 Minutes or less (2011): Don't waste your time with this one! In 30 minutes or less you will know what direction this movie is going. I really tried very hard to like it. But the little real humour that was to be found here was not enough for to convince me to like. First of all I can't believe that Ruben Fleischer who directed the brilliant Zombieland is also responsible for this title. They story doesn't flow, the characters are not that bad but far from likable. And the action is average although the intro scene with the main character Eisenberg racing does promise a lot. Aziz Ansari is almost the only one who is able to provide some laughs. Only don't expect too much of it because the jokes are very obvious. Don't waste your time with this one.